America’s AQ-4000 filter system, with DVPI pre-filter and adapter for Chinese municipal water systems. Recommended by TheBeijinger, BeijingKids, The New York Times, Health Magazine. One year standard warranty or upgrade to a lifetime warranty with our free Water4Life program. Remove pollutants, maintain healthy minerals. The winner of Health Magazine’s “Healthiest Product” award for 2010, this filter uses Aquasana’s unique selective filtration process: a combination of carbon filtration, ion-exchange and sub-micron filtration to produce clean, healthy water. Our drinking water filter products are certified to NSF standards 42 & 53 to reduce sediment, chlorine, lead, herbicides, pesticides, cysts, VOCs, SOCs, THMs and bad taste & odor. Our unique filter also leaves in healthy minerals for hydration and health. 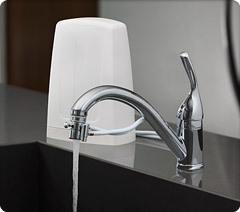 Aquasana’s unique three-step filtration uses the advanced technology to remove dangerous common chemicals and heavy metals from your drinking water. We use the materials and filter media of very high quality, no shortcuts and no compromises. The result is truly healthy, great tasting water for drinking, cooking, and preparing beverages at the convenience of your family’s kitchen faucet for under ￥0.3 a liter! Aquasana’s contaminant reduction capabilities are third-party tested and certified by to NSF standards 42 & 53.